Ali, the man Holmes had said he never wanted to fight. He had been Ali's sparring partner, and he had watched him and learned from him. He had called him his idol for the newspapers. 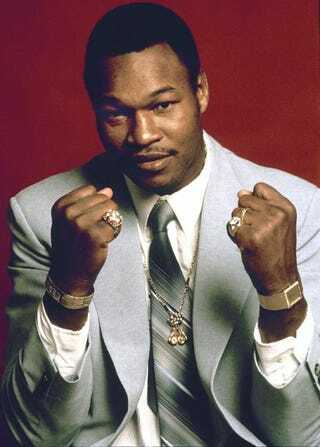 He had been on the undercard in Manila, had seen the act of will Ali—who was already beyond his prime—past Joe Frazier. And as Holmes developed and Ali's skills faded, a point had to come when Holmes knew he was the better fighter. But it was still Ali, and there was still something there that Holmes didn't have, and never would. Richie Giachetti is Larry Holmes' manager and trainer. He is his friend. He has been with the 30-year-old Holmes eight years, and he doesn't like the Ali fight at all. "I'll do my job," he will say later. "It's $4 million, but anyway you look at it, Ali gets knocked out or hurt. [Don] King keeps talkin' to Larry about gettin' out of Ali's shadow. Did Marciano get out of Joe Louis' shadow, knockin' out an old man? The shadow is there, and as shadows go, it's not too bad…." The way it comes out all at once, you know it's something Giachetti has said before, probably to Holmes on the way to New York. Holmes shuts it off. "Ali was yesterday, I am today. I been in his shadow too long, it's time to come out. No, the fight don't bother me. A fight is a fight. I don't care if he got hurt, I can't care. You care, that's when you get hurt your own self." It is as deep a disagreement as he and Giachetti have had, and something between them now feels wrong and unsettled. When I heard Ali had agreed to fight Holmes, the first thought I had was that Ali would be killed. The punch was five years gone, his hand speed had been mediocre over his last half dozen fights, and he'd been getting hit by people like Leon Spinks. I didn't see that two years in the pasture could have helped any of that. What figured to be left to him, at almost 39 years old, was the chin. Enough to keep him up a long time after he should go down. The second thought I had was that I didn't want to see it happen, and even if there was enough grace in that night to make me wrong once, there was nothing in it to make me wrong twice. And if the talk afterwards' about thyroid pills and a fight with Mike Weaver is more than talk, I won't be there. Ali might take the chance again. I won't. I couldn't watch it again. Ali without his talent, growing old in one long night, people everywhere without words, growing old with him.